With a debut on the Prada runway and space in the iconic brand’s latest campaign alongside industry veterans, Kristine Froseth‘s (Supreme Management) modeling career is off to an especially promising start. The bubbly teenage newcomer ranks among the most in demand faces of the moment and with her down to earth attitude and innate charm she’s sure to go even further. MDC caught up with the buzzed about beauty to talk working with the greats, future goals and why height doesn’t have to hold models back. KRISTINE: I started modeling about 2 years ago, when I was 15, yes. So, it’s gone by pretty quickly. KRISTINE: I went actually to the office! 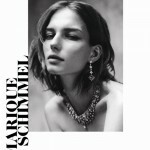 I was not scouted; my mother used to be a model when she was younger, so it’s like something I’ve always wanted to do. I just never thought it would be something I could do. Then one day I decided to go with my sister to the agency and asked what they had to say; I’d like to see what they thought. I hear you’re from Norway via New Jersey. KRISTINE: Well I’m originally from New Jersey actually, but my whole family’s Norwegian, so I’ve lived in Norway for almost half my life. I’d go back and forth because of my dad’s job. What would you say is the best part of modeling for you? KRISTINE: That’s a good question! I guess meeting all these new people. It’s interesting, very creative, being able to travel even though I’m so scared of flying; experiencing all these different cultures. I moved a lot back and forth so I like seeing new places and definitely meeting new people, and you get to do that in this industry. What was it like doing Prada as your first show? KRISTINE: Yeah. It was really… it was just unreal. I never thought I would ever do a show, because of my height, that’s what they kept telling me, so it was crazy getting that call from my bookers. And doing the show was such an adrenaline rush, and I didn’t know how much time they put behind it.. with all the fittings and everything, so, it’s a process, I didn’t know that, so it’s fun to see how much work goes in to it. And you got to do the campaign as well. KRISTINE: Also really amazing. 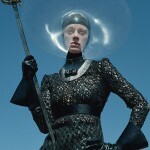 Working with Steven Meisel and Pat (McGrath) and Olivier (Rizzo)- and the whole team- was incredible… I had a great time! What are some things that you’d like to do in the future with modeling? KRISTINE: I would definitely love to do Vogue, for sure. I guess that’s every models’ dream. And work with Bruce Weber, that’s always been a dream of mine, and do some more campaigns, I don’t know it’s just so much fun- I want to do everything! You were talking a little about your height, not thinking that you were going to do shows, do you think right now it’s easier for a model who is shorter to get her foot in the door? KRISTINE: I actually think so, though when I go to castings they always tell me I’m too short, so I guess the height is actually pretty important for the industry but maybe they’ll make an exception. I mean, Kate Moss she’s not that tall and she got very far! Absolutely striking, she will be a star. The height is necessary too. Kate Moss is unique. Obsessed with Kristine. She is absolutely stunning! I knew she would be a star. What a find, another Heartbreaker doing well. I would love to see some shorter girls walking in the upcoming seasons. I think change is in the air in the fashion industry and we have to embrace it! And I also agree Cara is definitely not 5’9 she is barely 5’8 I would say.